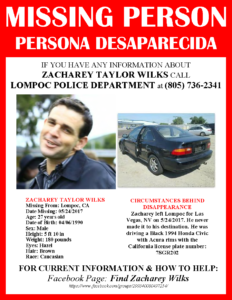 Elizabeth’s son Zacharey Wilks has not been seen since he left his home in Lompoc on May 24. He was driving to see family in the Las Vegas area and planned to visit a casino when he arrived. Zacharey drives a black 1994 Honda Civic with distinctive Acura rims, California license plate 7SGR202. If you have any information about Zacharey, please call LOMPOC POLICE DEPARTMENT at (805) 736-2341 immediately. The family has setup a gofundme page to help hire additional professionals for the search efforts. Please contribute what you can. Visit the GoFundMe here. Download, print and share the flyer for Zacharey here. You can also visit the Find Zacharey Wilks Facebook page for more information and to stay updated on what’s happening. Please share this post with friends and family. Let’s do everything we can to help our sister find her son.